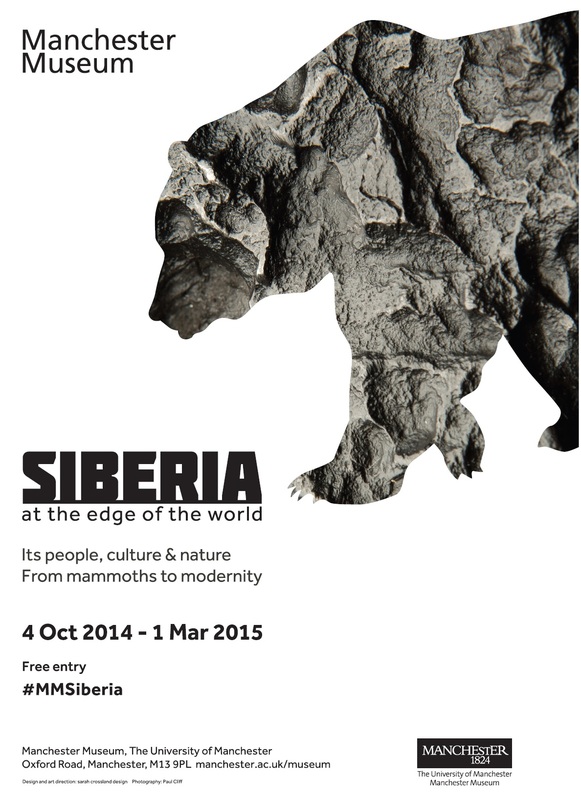 Update: The paper is now published and can be downloaded from the journal webpage. 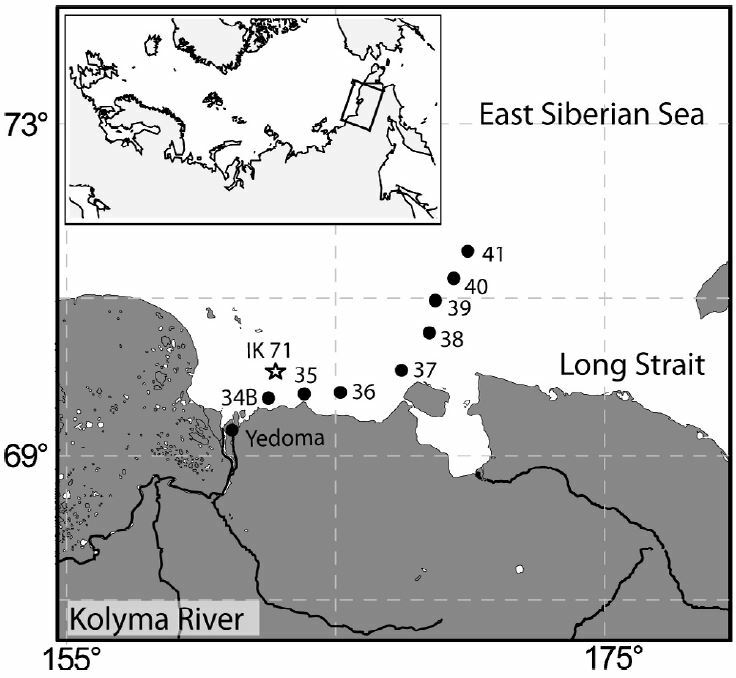 The study continues our work on the East Siberian Arctic Shelf, and contains two new datasets. 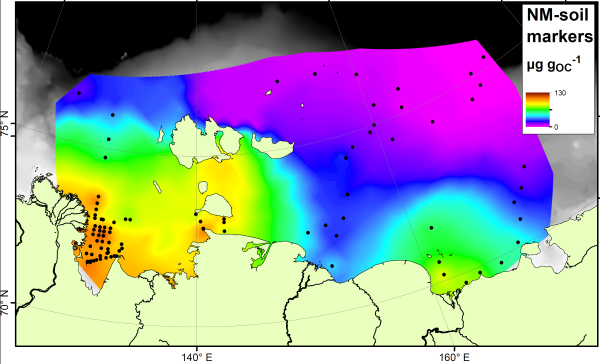 The first is a radiocarbon study, measuring the age of organic matter on the shelf using carbon dating (see map above). By measuring the age, we can determine whether the carbon has come from the ocean (very young), the topsoil (quite young) or the coastal permafrost (thousands of years old). 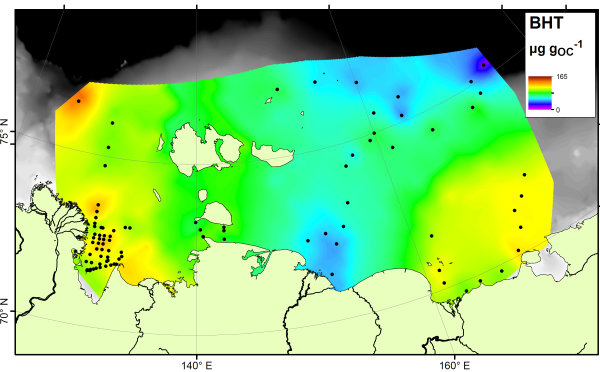 We combined our results with those already measured on the shelf to form the most complete radiocarbon map for this area. 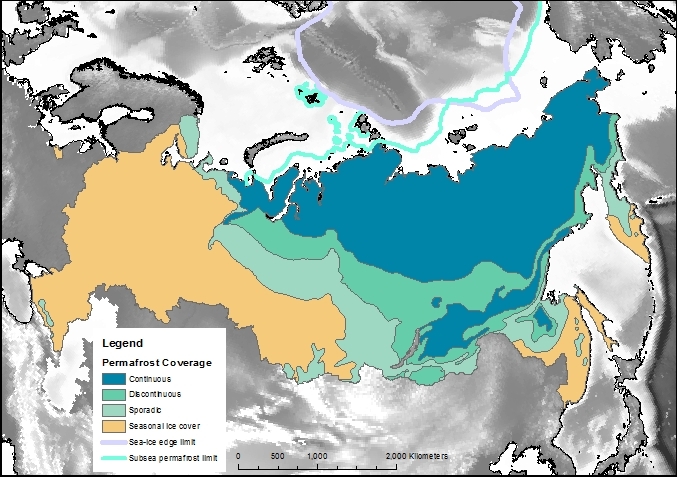 The high-resolution map shows that areas close to the shore and away from the major rivers are home to very old carbon, almost certainly sourced by erosion of old permafrost cliffs. 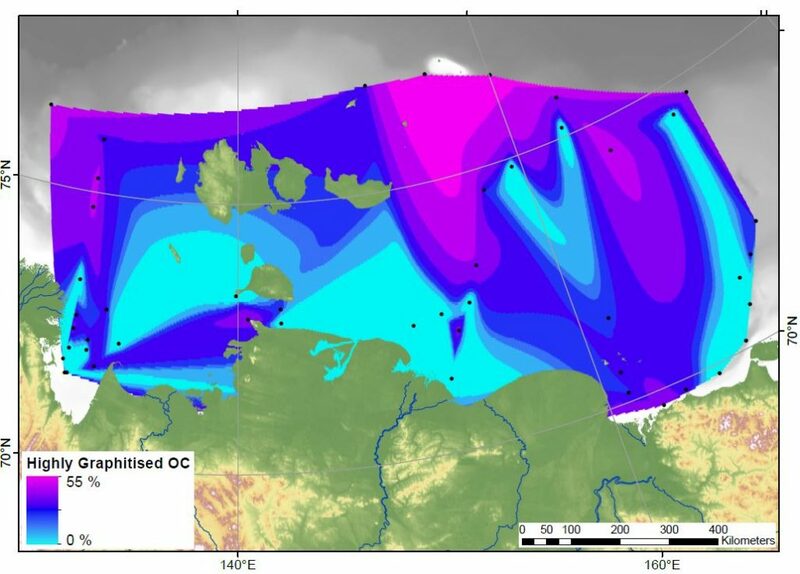 Elsewhere on the shelf, the carbon is younger but not as young as modern topsoils or ocean carbon. 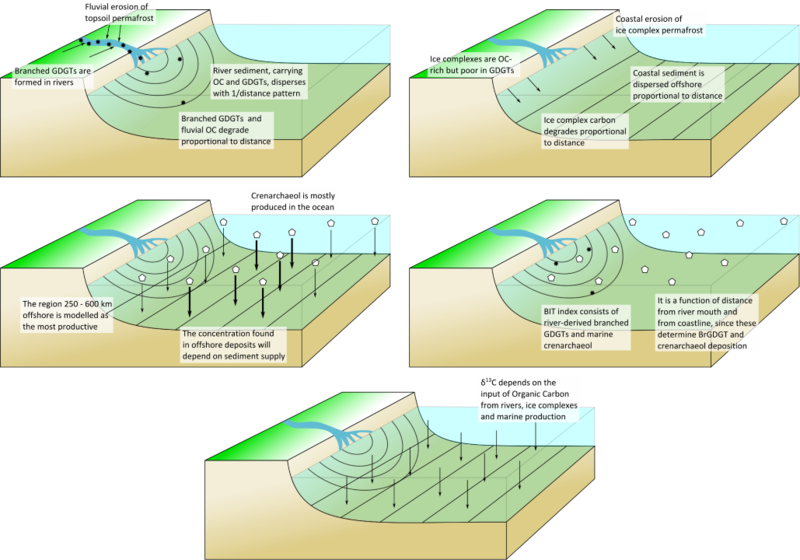 Therefore the coastal erosion carbon is having an influence right across the shelf. 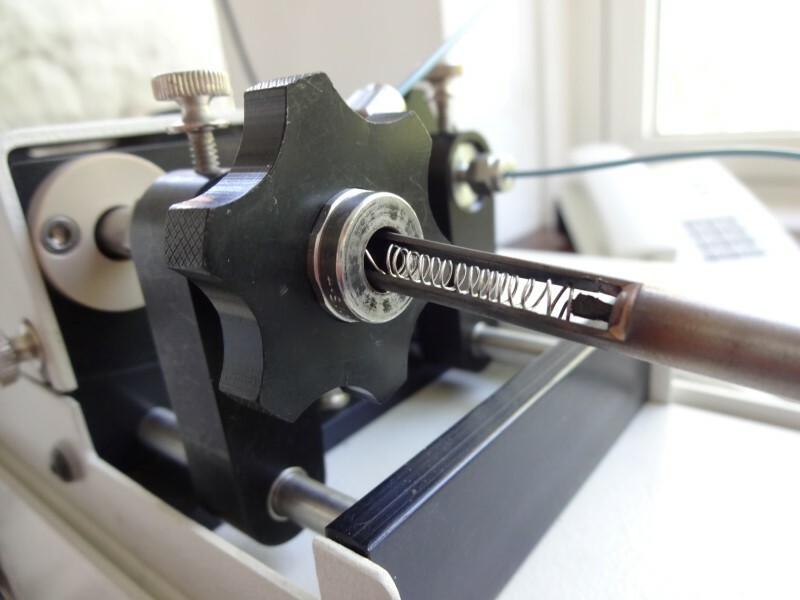 Our second technique is pyrolysis GCMS, where samples are smashed into small pieces using high temperatures and the small pieces are then analysed using GCMS. This technique generates a large amount of small pieces, too many to analyse each one individually, and so we decided to concentrate our efforts on a few target molecules. 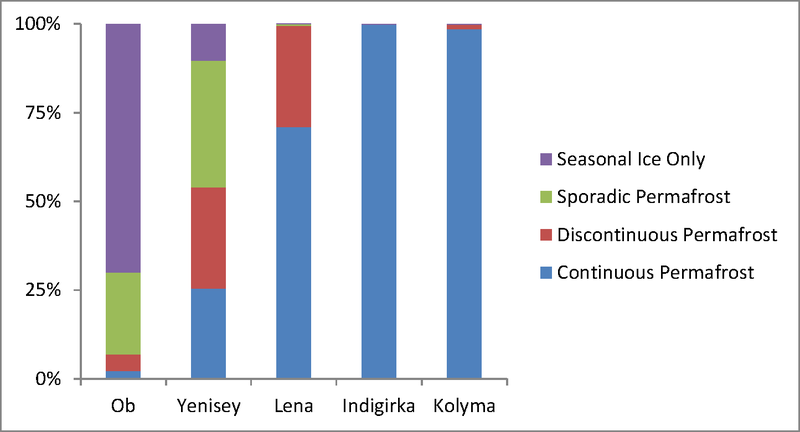 These included Phenols, which are probably sourced from lignin, a major component of land plants, and Pyridines, which are nitrogen-containing compounds probably sourced from proteins. 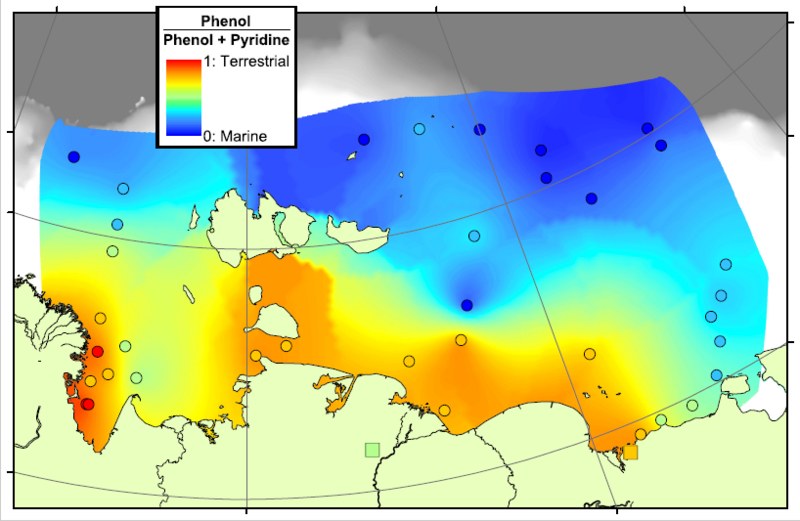 We think that a lot of the Pyridines in the Arctic Ocean will come from organisms living in the ocean itself, and therefore the Pyridines are a potential tracer for marine organic matter. 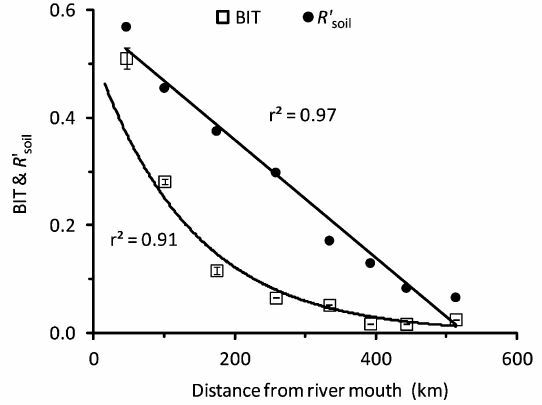 By comparing the concentrations of Phenols and Pyridines, we can estimate the amount of terrestrial and marine organic carbon in a sample. 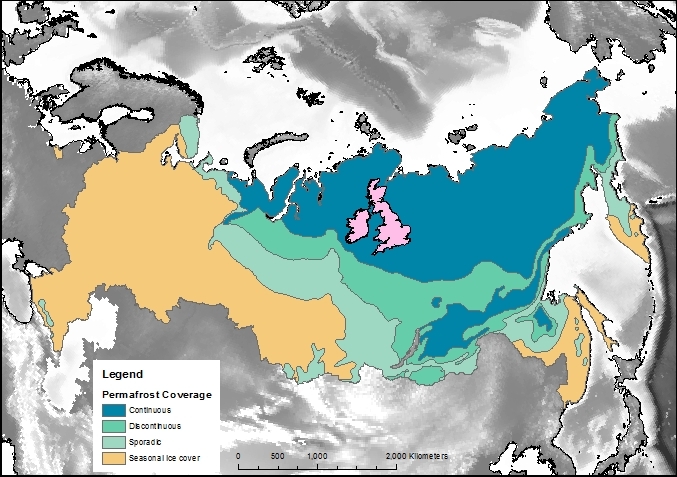 In the map above, red areas are dominated by Phenols and are therefore rich in terrestrial carbon, blue areas are dominated by Pyridines and are therefore rich in marine carbon. 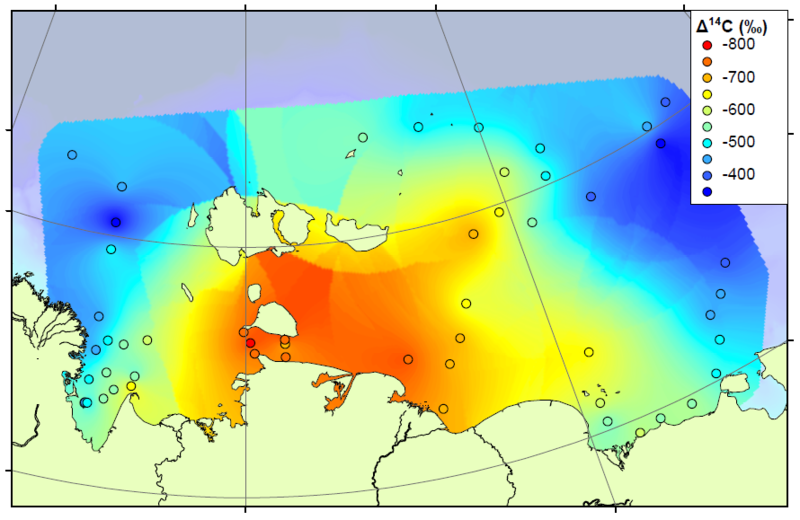 This pattern matches very well with our previous work in the region, showing that there is a transition from terrestrial to marine conditions across the Arctic Shelf, and that the transition zone lasts for hundreds of kilometres offshore. 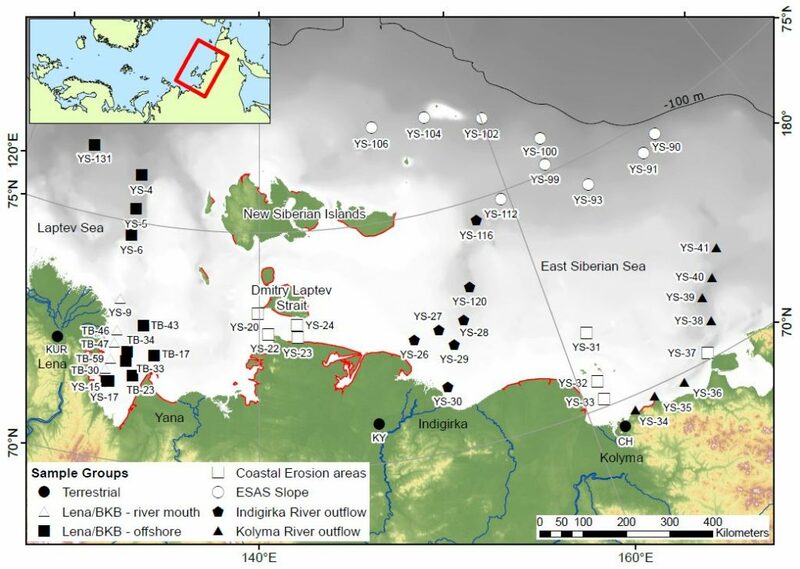 This means that there is a lot of terrestrial carbon being deposited, and hopefully buried, on the shelf, rather than all of the eroded carbon being degraded and released as CO2. My last post talked about Open Access publishing, and the various philosophies for spreading (and/or making money from) academic knowledge. Now there is a chance to play an active part in the publishing process. My latest paper has been submitted to a journal called “Biogeosciences” which is administered by the European Geosciences Union (EGU). Their journals are published using a super open process, where more than just the final paper is released free-of-charge to the world. Whereas in regular Open Access publishing anyone is free to read the final reviewed work, in EGU journals the initial version is also made available. Two reviewers are selected from the community, and their reviews are shown on the website as well. Everyone else is free to read and comment on the paper, raising questions that the authors have to respond to. It is hoped that this system is a) transparent b) open to more (constructive) criticism than the standard two-review system and c) faster, since the paper is available for people to read at an earlier stage of the process. 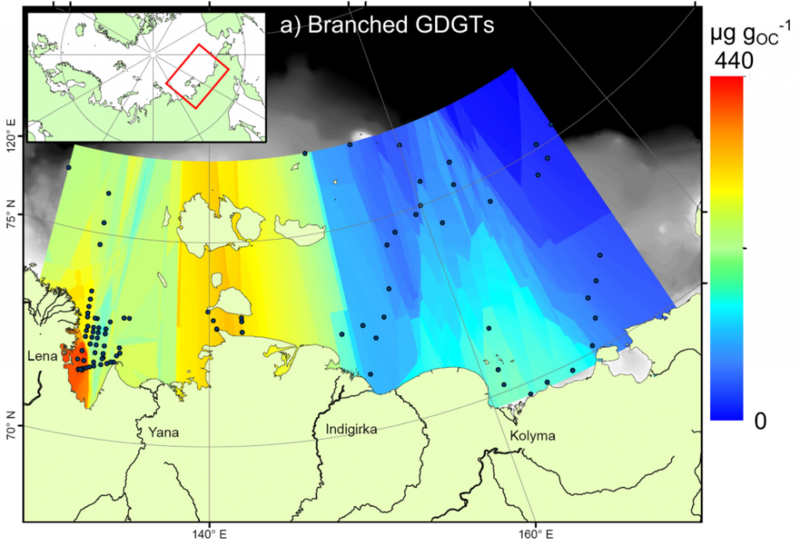 Our paper discusses the distribution of GDGT biomarkers on the East Siberian Arctic Shelf. 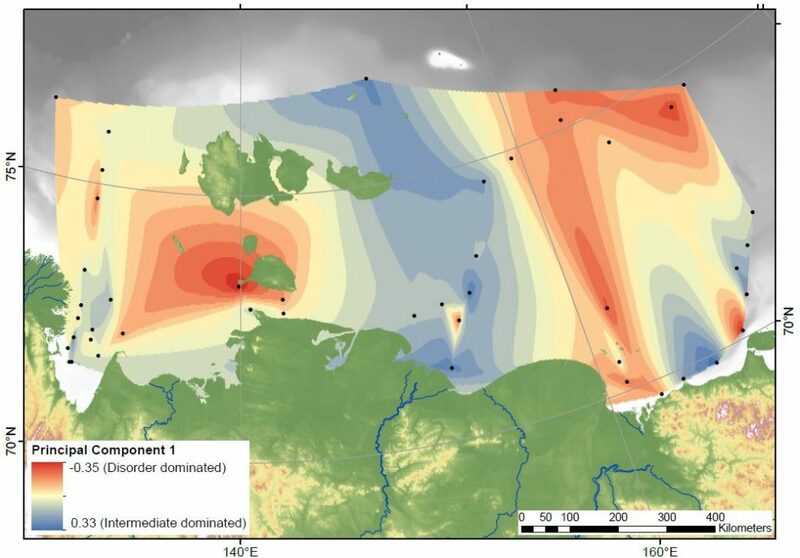 We measured these biomarkers to determine whether the organic matter deposited on the shelf came from land or ocean sources. 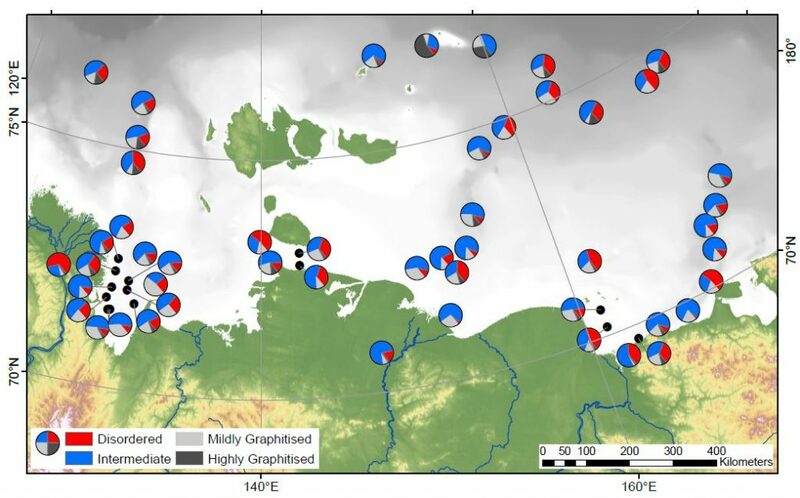 When we had made these measurements, a model was created to try and explain the observations and work out the budget for carbon being delivered to the shelf from large Arctic rivers. 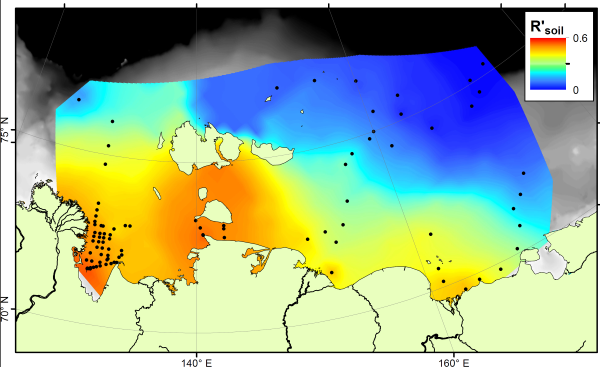 When displaying data near the poles, the choice of map projection is very important. Displaying a 3D object in a 2D screen is always problematic, and involves compromises in either accuracy, practicality or legibility. 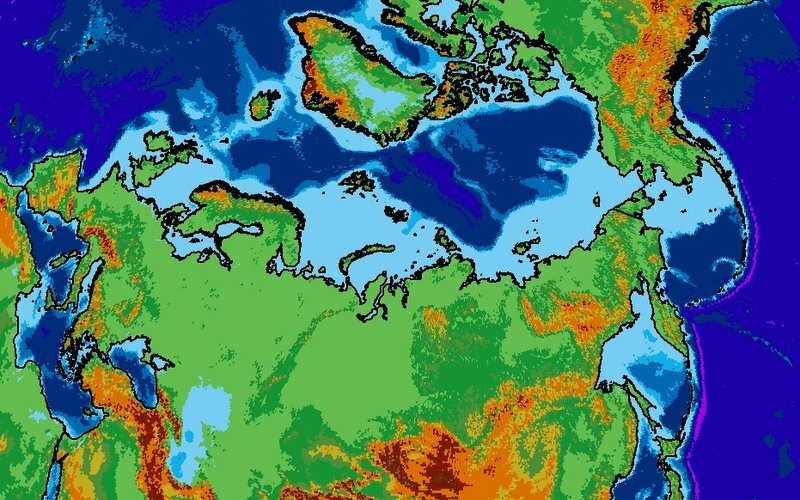 The standard Mercator projection, as used in the majority of maps seen on a day-to-day basis, stretches the polar regions to infinity. 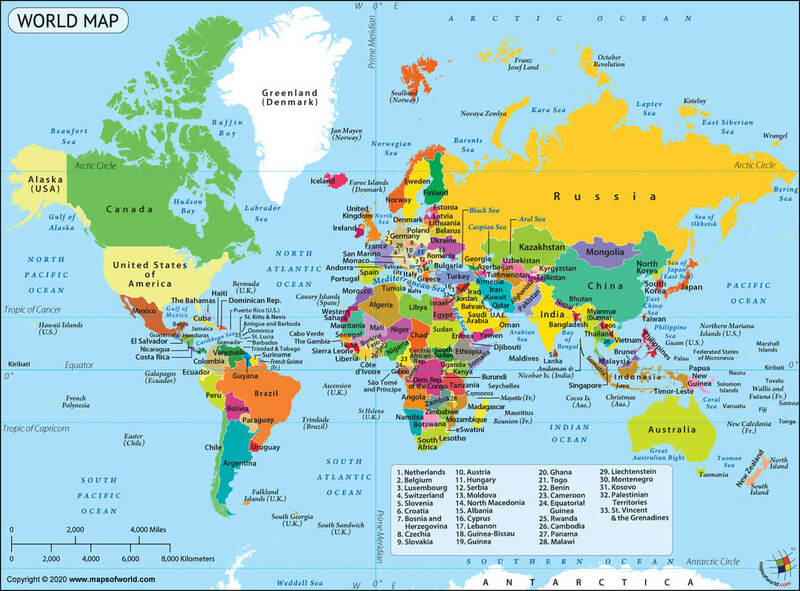 Greenland looks enormous on this map, yet it is actually just smaller than the Democratic Republic of the Congo, and only one quarter of the area of Brazil. 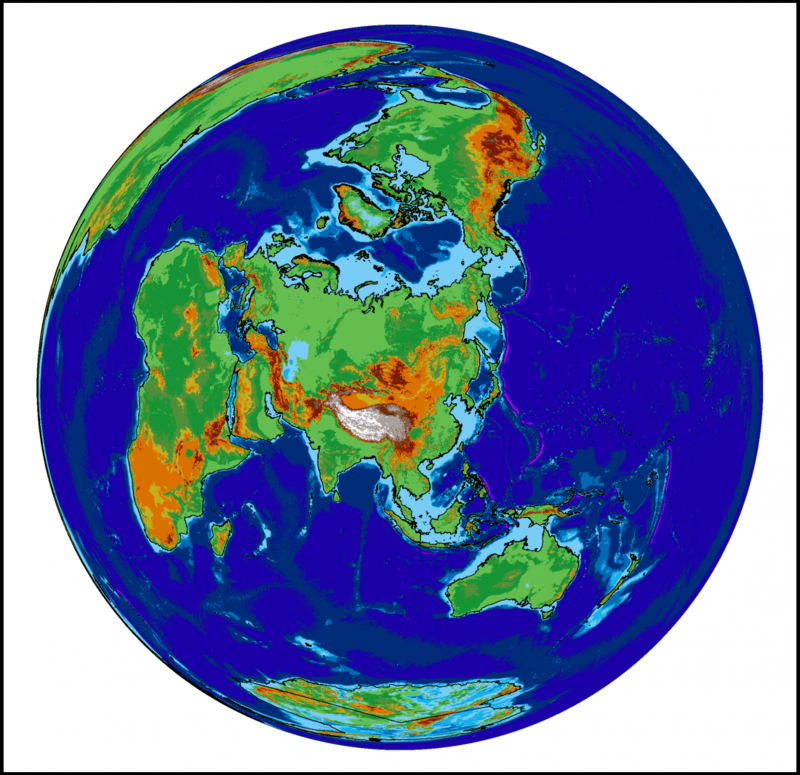 To get around this problem, other map projections are available. 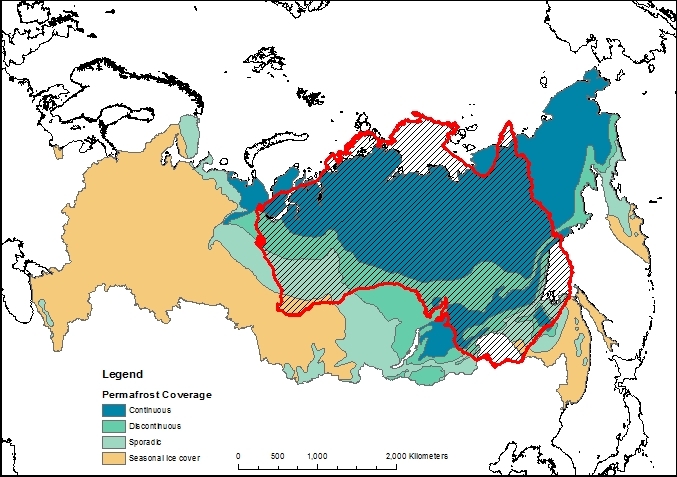 The projection I have chosen to use for maps of the Siberian permafrost is the Lambert Azimuthal Equal Area map. 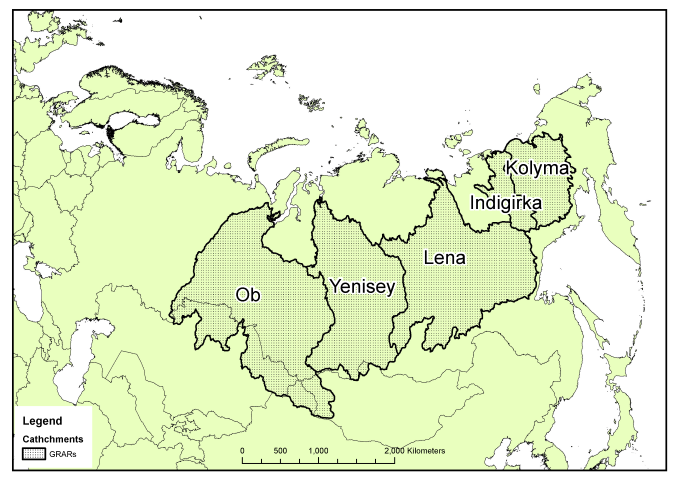 This projection adjusts shapes and distances in order to preserve the true area of each country. 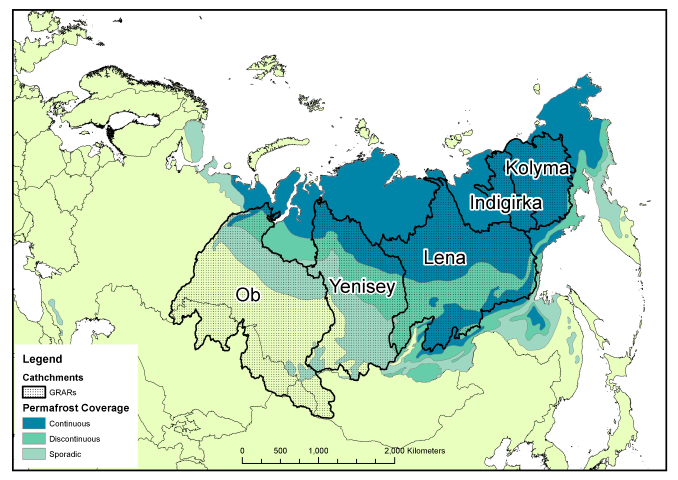 If you look at the full-size version of the map above (click it, or download here) then the view of the Arctic region is relatively consistent with the true layout as viewed from above, but there is an increasing amount of distortion as the distance from Siberia increases. Look out for this projection in future posts!